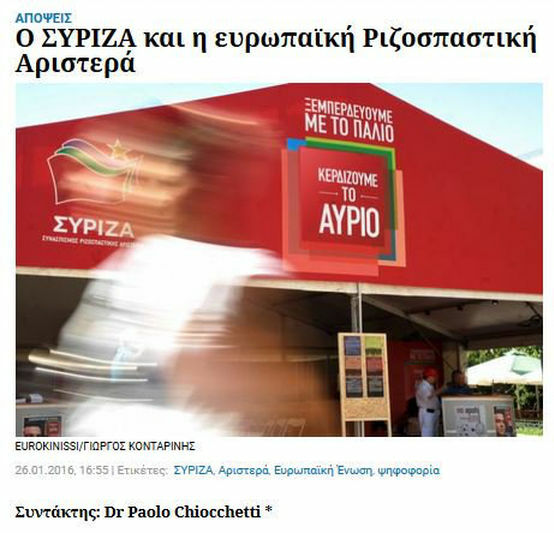 My op-ed for the Greek newspaper H Εφημερίδα των Συντακτών (Efimerida ton Sintakton) can be read here. An English version can be read below. The author is an Italian political scientist. His book “The Radical Left Party Family in Western Europe, 1989-2015” is due to be published by Routledge this autumn. The meteoric rise to power of SYRIZA has made a sensation among radical left activists and voters across the continent. Since 2012, they have avidly been following its electoral surge, its ideological and organisational debates, and its actions in government, seeking confirmation of their long-held hopes and drawing lessons from its successes and contradictions. Observers marvelled at its energetic youthful leader, its frontal criticism of the established political system, and its modes of political and social intervention. In the first half of 2015, this curiosity turned into unbounded enthusiasm, as the party snatched a sensational victory in the January election, earned widespread sympathy in the negotiations with the creditors, and set off a stunning popular mobilisation in the July referendum. In the same period, SYRIZA consciously threw itself into an unprecedented European offensive. It tightened the long-standing ties to its sister parties within the Party of the European Left (PEL) federation and beyond. It had Alexis Tsipras run as official candidate to the office of President of the European Commission in the July 2014 European Parliament election. It encouraged the creation of foreign branches and the mobilisation of the intellectuals of the Greek diaspora. It organised well-publicised international tours, conferences, and meetings. Finally, it framed its negotiation strategy as an explicit appeal to the European public opinion, patiently arguing the case for ‘another Europe’ with the hope of sparking a major leftward evolution of the political scene across the continent: first by winning the tacit support of key social democratic leaders such as Renzi, Hollande, or Faymann, and then by inspiring further electoral successes by radical left organisations in other countries. This strong European dimension of the SYRIZA phenomenon has two grounds. On the one hand, the fate inflicted on the Greek people by the Troika is nothing but an extreme version of the same austerity medicine that is currently being administered throughout the Eurozone. Empathetic identification is therefore relatively easy, especially among the populations of the European periphery that had to experience similar high-handed EU interventions and are less susceptible to racist narratives on thrifty Northern ants and profligate Southern grasshoppers. On the other hand, the vast majority of radical and less radical leftwingers firmly believe that extra Europam nulla salus. The inextricable integration of European capitalism and political institutions, they claim, prevents from a solitary course and dictates a strategy of concerted continental mobilisations. In the second half of 2015, the mood among the European radical left turned sombre, as the capitulation of Tsipras to the creditors smashed its aura of invincibility among national and international supporters and casted doubts on the overall credibility of the radical left project. Some denounced the betrayal of the Thessaloniki programme, aligning with the splinters of Laiki Enotita. Others defended the agreement as a way of biding time, waiting for a victory of PODEMOS in Spain. The majority of commentators praised the courage of the fight but acknowledged a major defeat. Nevertheless, the interest in the Greek laboratory however remains intact, as events in the small Mediterranean country are widely perceived to be a crucial battlefield for the future of the whole continent. Altogether, the impact of SYRIZA on the rest of the European radical left has been mixed. Electorally, the hoped-for radicalisation indeed took place in 2015, but it came too late to affect the battle on the third memorandum and it is too limited and uneven to tip the European political balance in the foreseeable future. Leftist parties scored 21.5 per cent in Portugal and 25.9 per cent in Spain, although they failed to gain the upper hand over their socialist competitors. In Ireland, the Sinn Féin and smaller radical organisations are also polling above 20 per cent in the run up to the election this spring. Finally, the upset victory of Jeremy Corbyn in the leadership election of the British Labour Party has offered the first concrete sign since decades of a possible left turn of the mainstream moderate left. However, in the decisive countries of the Eurozone – Germany, France, and Italy – the radical left continues to stagnate at relatively low levels, the moderate left is clinging to its neo-liberal course, and protest against austerity and the EU is increasingly being appropriated by far-right forces. Politically, the experience of SYRIZA in government had a paradoxical effect, emboldening the radical left in its calls for an alternative to austerity and neoliberalism but at the same time showing that the current framework of the EU and the Eurozone effectively bars such course. This has rekindled the debates on the necessity of a ‘left exit’ from the euro and of a coherent progressive strategy of national development – at least as a ‘Plan B’ to be used as a last resort –, but a consensus on this fundamental question is not in sight.